Following last week’s announcement of “Chicken.org” opening in Philadelphia, the same owners have converted its other meat-themed establishment, “Burger.org” into a Glatt Kosher burger joint as of today. The Israeli owners of these establishments have added 2 fleishig restaurants to Philly within a matter of a few days. 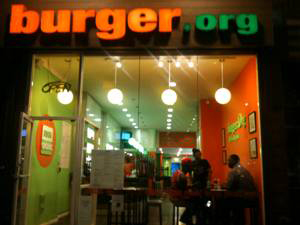 Burger.org is located at 326 South Street, Philadelphia, PA. The Community Kashrus of Greater Philadelphia is providing the restaurant with kosher supervision. We’re looking forward to hearing good things coming from this new chain and from the growing kosher scene in Philadelphia.